When we bought our house eight years ago, we paid top dollar. Unfortunately, over the years, the value of our house declined tremendously due to the mortgage crisis. Our mortgage was underwater. 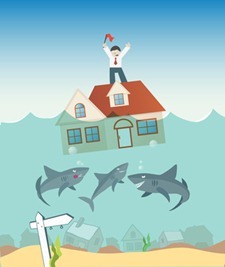 We were hoping that the housing market would bounce back quickly and that the underwater mortgage would resolve itself. However, so much time had passed, and we realized that this problem was not going to be resolved anytime soon. We started thinking about whether refinancing the mortgage would be a step in the right direction. Plenty of people in underwater mortgages don’t even bother to think about refinancing their homes because they assume that it isn’t impossible. However, thanks to some new programs developed by the government and by the banks, this is not the case. There are diverse opportunities for people in this situation to get the help that they need to save their homes and their finances. Refinancing is not easy, and contrary to popular belief, refinancing a mortgage is not always a good idea. Understanding the basic goals and methods of refinancing before you decide to initiate this process is very important. When you first bought your house, you signed an agreement with a bank or some other lender. This agreement stipulated how much you owed, how long you would have to pay it back and how big each monthly payment toward the principal would be. You also agreed to an interest rate. This interest rate had the largest impact on the size of your monthly payments. When you refinance a mortgage, you essentially form a new agreement, either with the original lender or with another. Since there will be fees involved and a brand new lender will have to buy the old mortgage outright, you will end up owing more for this new mortgage. However, rates are very low right now. A slightly larger mortgage at significantly lower rates could save you a lot of money. For us, the answer was yes. The rates were so much lower than when we first purchased our home. We were also really interested in lowering our monthly payment, so we decided to pursue it. To determine if you should refinance your mortgage, ask yourself the three questions found below. If you can answer yes to all three, then refinancing is most likely the right idea. If you are not sure about your answers, there are online resources to help you calculate payments and decide if this is a good idea for you. Do you plan on living in your home for at least the next two years? Is your current mortgage less than 10 years old? Do you pay interest on the current mortgage that is higher than 5.5%? Once we determined that we wanted to pursue a refinance, the next question was whether it would even be possible because our mortgage was underwater. The value of our house had dropped significantly so the house was worth much less than what we owed on it. We asked around to learn about our options and during this process, we learned about the HARP refinance program. You must have acquired your mortgage before June 1st, 2009. The entity backing your loan must be Fannie Mae or Freddie Mac. If you meet these requirements, you may qualify for a HARP refinance. Luckily, we qualified based on the requirements above. Plus our current mortgage provider, Wells Fargo, was participating in the government-sponsored program, so we were able to stay with them. But the next hurdle we had to deal with was regarding my self-employment income. Philip has a traditional job, but I don’t. So during the application process, when they started asking about employment, we advised them that I had non-traditional income and was basically self-employed and had been for the past couple of years. When asked to provide income figures, I simply pulled out my tax returns and rattled off the numbers to them. They in turn, requested a transcript of my tax returns from the IRS and requested written permission to speak to my accountant to verify my income. A few days later, after they verified my income, we got word that we were approved. We were very happy with the lower interest rate we received; however, our monthly payments were not quite as expected. The reason we chose to refinance in the first place was to reduce our payments, but instead, our monthly payment has gone up. Why? Well, it’s simply because we agreed to reduce the term of our mortgage from 30 years to 20 years. This means we’ll wind up paying less interest over the course of the mortgage. Property taxes, and home owner’s insurance are also now included as part of the mortgage, whereas we used to make separate payments for them. So even though our monthly payments seem higher, we are actually paying less than what we would have been paying if we had to pay our property taxes and homeowner’s insurance separately. So it all works out. If you’re thinking about refinancing and don’t think that you will qualify because your home is underwater or you’re self-employed, be sure to shop around. Many lenders have started their own refinance initiatives, which may be beneficial. For people who can afford a new mortgage, at a lower rate it makes sense. My son did a refinance to lower his payments, and they also made him group in his real estate taxes which he used to pay separately. Overall he was very happy with the move. His payments are still lower with the taxes rolled in. Very interesting, useful and informative post about how to refinance an underwater mortgate. This is great information. I am glad it worked out well for you! but, this is great info. Great article! I usually can’t wrap my head around financial mumbo jumbo, but you really made it easy to understand, lol. I’m glad everything worked out for you! Great information! Thanks for sharing your story. We were right there with you we did end up loosing our house! I wish we knew about this back then it would have been worth a look! Thanks for sharing this! Oh no, so sorry to hear Michelle. Now that you know, you can share the info with others who may be in the same boat. Great information! It’s sad how many people bought houses for much more than they are worth now. The economy really messed up a lot of home values. So true. I wonder if the housing market will ever really recover.